I have been visiting Mr Cruson on Camberwell High Street on and off since 2005. His was the first greengrocer I regularly used. Growing up in the countryside meant that, as shops were a significant drive from our house, I wasn’t party to much food shopping. I got the bus to and from school and Mum usually bought food on her way back from work. He told me the other day that he’d had the shop there for 45 years and I can believe it. His hair was white when I first moved to Camberwell in 2005 and returning again ten years later, he stoops very low over the produce as he lays it out each day, wearing a white greengrocer’s coat. The produce is not always in perfect condition but there is always something different to choose from because each week he buys in a selection of seasonal novelties. A very good thing too, is that he keeps a stash of avocados ripe enough to eat that day on the counter. As well as vegetables and fruit, spices hang up behind the counter, and there are boxes of dried salt fish, bags of nuts, washing up bowls of olives, shelves of sundries and a fridge containing strongly flavoured Cypriot sausages in vacuum packaging and Halloumi cheese. 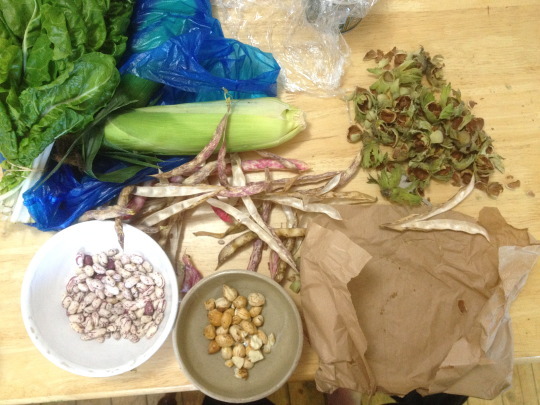 When I went by on Sunday afternoon there was a box of fresh hazelnuts in their pale green brown shells outside the door, as well as drying borlotti beans – some still fresh and wet, some dried out fully – and huge luscious bunches of chard inside. I cannot emphasise enough how good the chard dish was, I could eat it all day. 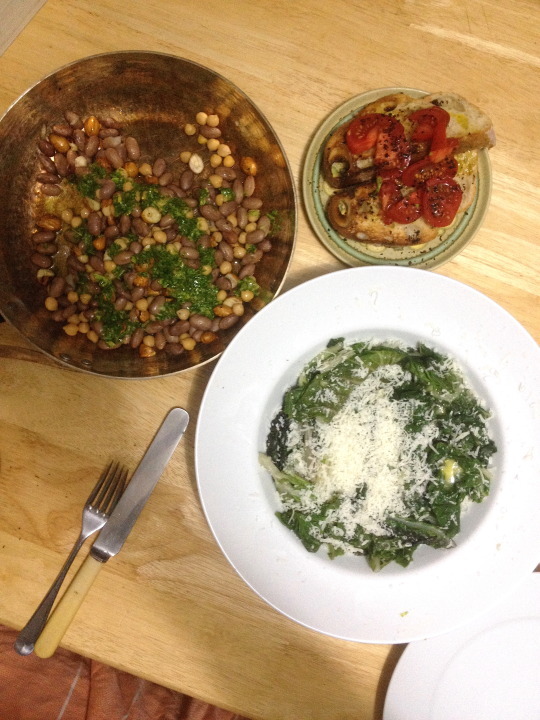 Sam was a big fan of the borlotti beans and hazelnuts with a powerful green dressing. Each dish was flavoured very simply, taking close care of seasoning. This meal took me 30 minutes to make. 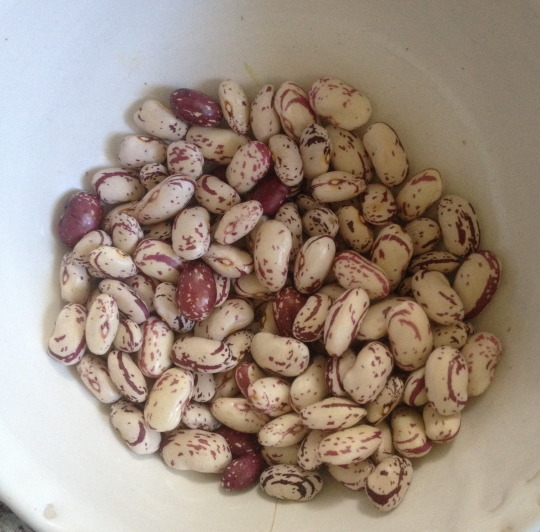 I had already cooked the borlotti beans but if you use tinned ones it will take the same amount of time. All together these three dishes served 2 for dinner. Add grilled fish, roasted lamb shoulder, or seared and sliced rump steak – or scale up portions for a grander or bigger meal. – the ones I had were sort of half-fresh/half-dried and I boiled them for around 40 minutes in water until they were soft and added in a pinch of salt after 30 minutes of boiling. For actual dried beans soak for 12 hours the night before in cold water and then boil for 45 minutes – 1 hour, adding in salt after 30 minutes. a few tablespoons of fresh hazelnuts removed from their shells using a nutcracker (or mole grips, as we used..!). I am sure that normal hazelnuts could also be used and would simply bring a richer flavour to the dish. Fresh hazelnuts taste somewhere between a bean and a nut. In a heavy frying pan warm 2 tablespoons of oil and add the borlotti beans, chickpeas and hazelnuts and warm gently with a pinch of salt. Mix all of the dressing ingredients apart from the lemon together thoroughly, squeeze in lemon gradually, to taste. Season with salt and pepper. Drizzle over the warm beans when ready to serve. 1 large bunch of chard or however much you want – it shrinks significantly during cooking. Remove the stalks and chop into 2 inch lengths. In a large lidded pan, bring 2cm of water to the boil with a hefty pinch of salt in. When boiling, add in the stalks and put on the lid. After 2 minutes, add in the leaves and put the lid back on. After a few more minutes, check the leaves – they should be soft and reduced in size without being mushy. Drain well and place on a plate or in a serving dish. In the still-warm, drained pan, add in the butter. The residual heat will melt the butter. Pour over the chard with the grated parmesan. Season with a grind of pepper. Toast the bread. Rub it with the garlic clove cut in half – thoroughly. Heap on the tomatoes and sprinkle with chilli flakes, a good drizzle of olive oil a squeeze of lemon juice and a pinch of salt. Previous Kohlrabi, Fresh Hazelnut and Greek Yogurt with Salt.